Learn How You Can Benefit From Enzyme Support With VeganZyme! Trying VeganZyme is risk free! VeganZyme is the most advanced, full-spectrum, systemic and digestive enzyme supplement in the world. It contains the broadest spectrum of vegetarian-based enzymes available anywhere. Completely toxin-free, this formula helps your body digest fats, sugars, proteins, carbohydrates, gluten, fruits and vegetables, cereals, legumes, bran, nuts and seeds, soy, dairy and other foods. VeganZyme also provides systemic enzymes to help your body break down and expel mucus and toxins. 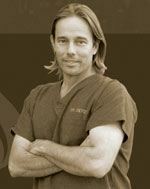 "For years, I've used digestive and systemic enzyme formulas to enhance my own health and that of my patients. However, I always had to use two or three products. I was never able to find a complete, vegan-friendly formula that contained all the enzymes I wanted. This prompted a four year journey to develop the most advanced, all-in-one, full-spectrum, digestive and systemic enzyme formula that was vegetarian and vegan friendly -- no animal sources." "This wasn't easy and it took over a year to create and source the perfect formula. One challenge was including glucose oxidase, an enzyme that converts sugar into hydrogen peroxide (bees secrete it into honey for indefinite preservation). In fact, Global Healing Center is the first company in the world to offer this enzyme." "The world's leading enzyme manufacturers were shocked at the cost of the comprehensive formula but, unlike other manufacturers whose only concern is low costs and high margins, our number one priority is quality. We produce the best products possible and we're proud to say that VeganZyme, the most complete, full-spectrum enzyme formula in the world." As stated by The National Institute of Health, nearly 70 million Americans experience digestive disorders. Enzymes are integral to digestion. Without them, macronutrients are excreted without use. Cooking fruits and vegetables may destroy their natural enzyme content. People with a spastic colon may be deficient in lipase, an enzyme that supports fat digestion. 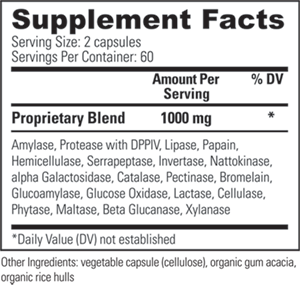 The human body does not produce cellulase, it must be taken in supplement form! Up to one in four people may be lactose intolerant. What are the Benefits of VeganZyme? Promotes digestion and nutrient absorption. Helps your body break down toxic compounds. Breaks down phytic acid from plants, grains and seeds to increase nutrient availability. Defense against harmful, metabolic by-products. We are sure you will see and feel the health benefiting results of enzyme supplementation with VeganZyme. Why is VeganZyme the Best Enzyme Support Available? Provides digestive and systemic enzyme support. It's the most comprehensive enzyme blend ever developed! Contains stable, plant-based digestive enzymes with a wide pH range. Vegan friendly, gluten free, GMO free. What are the Top 3 Questions People Ask About VeganZyme? 1. Why do I need enzymes? Enzymes are responsible for constructing, synthesizing, carrying, dispensing, delivering, and eliminating the ingredients and chemicals our body uses. Digestive enzymes break down food to release nutrients for energy production, cell growth, and repair. Systemic enzymes support the body's processes. 2. Does food contain enzymes? Raw, live foods contain enzymes; cooked and processed foods are void of enzymes. A digestive enzyme supplement enhances digestion to get the full nutritional value of food. 3. Are enzymes harmful? Not at all! As active protein molecules, enzymes do not accumulate in the body. Take supplemental enzymes with meals to support digestion. Take additional enzymes between meals for systemic and immune system support. Capsules can be pulled apart and the contents mixed with purified water or juice. Start Supplementing With VeganZyme Today and Boost Your Health and Wellness! Glucoamylase breaks down starch and is derived from Aspergillus niger. The glucoamylase enzyme (also called amyloglucosidase) is produced by the fermentation of the fungal organism Aspergillus niger. Glucoamylase is an exoamylase that hydrolyzes (breaks down) starch, producing maltose and free glucose subunits from the non-reducing end of the starch. Along with other amylases, glucoamylase further enhances the digestion and nutritional value of food based starches. Xylanase breaks down xylose (high fiber foods, grains and cereals), and is derived from Trichoderma reesei. Xylanase is a special kind of hemicellulase. It is especially effective at digesting high fiber foods, which have a very high content of xylans, a complex polysaccharide made up of a chain of 5-carbon sugars called xylose. Xylanase is also produced by fermentation of the fungal organism Trichoderma reesei. Beta Glucanase breaks down beta glucans (high fiber foods, grains and cereals), and is derived from Trichoderma reesei. The cereal grains, wheat, barley and rye, contain beta glucans, a kind of carbohydrate. Beta glucans can become viscous in the intestinal tract, slowing natural peristalsis (intestinal contractions). The Beta glucanase enzyme hydrolyzes these glucans, reducing viscosity and balancing natural peristalsis. Beta glucanase is produced by fermentation of the fungal organism Trichoderma reesei. Beta Glucans are most commonly found in cereal grains, wheat, barley and rye, as well as bakers yeast. Serrapeptase breaks down fibrin and mucous, and is derived from Serratia marcescens. Serrapeptase is a powerful proteolytic enzyme with fibrinolytic and redness-reducing activity. It is a bacterial source protease enzyme produced by the fermentation of Serratia marcescens. Serrapeptase is used primarily as a systemic enzyme. It supports healthy joint function, helps maintain a normal swelling response and demonstrates powerful fibrinolytic activity, which is important for cardiovascular support. Other functions include a lessening of scar tissue and a reduction in the viscosity of mucous in lungs and nasal passages. Nattokinase breaks down fibrin and mucous, and is derived from Bacillus natto or Bacillus subtilis natto. The organism that produces nattokinase was originally discovered in a fermented soy food called natto. Nattokinase is a powerful proteolytic enzyme with fibrinolytic activity derived from the bacteria Bacillus subtilis natto and/or Bacillus natto, which was originally found in NATTO, a traditional fermented soybean food that is very popular in Japan. Alpha Galactosidase breaks down complex carbohydrates, and is derived from Aspergillus niger. Alpha Galactosidase helps digest grains and legumes, which contain many non-digestible sugars called oligosaccharides. These often result in abdominal discomfort, gas and bloating. Alpha Galactosidase breaks down these oligosaccharides very effectively. It is produced by the fermentation of Aspergillus niger. Invertase breaks down sucrose and table sugar, and is derived from Saccharomyces cerevisiae. Invertase is another carbohydrase enzyme that splits sucrose (common table sugar) into its component parts, glucose and fructose. Combined with all the other carbohydrases, it enhances the overall digestion of starch and other carbohydrates. It is produced by the fermentation of Saccharomyces cerevisiae. Pectinase breaks down pectin and dietary fiber, and is derived from Aspergillus niger. In plant cells, pectin consists of a complex set of polysaccharides that are present in most primary cell walls and are particularly abundant in the non-woody parts of plants, especially fruit and vegetables. Pectinase selectively hydrolyzes and depolymerizes naturally occurring pectin. Vegetable capsules are used instead of standard drug capsules that are composed of protein sourced from bovine, porcine, equine, and even fish. Take 2 capsules twice daily. For digestive support, take enzymes at mealtime with first bite of food. For systemic support, take at least 30 minutes before or 2 hours after a meal with a full glass of purified water. Can VeganZyme be taken by people who are not vegan? What happens to enzyme levels as we age? Is VeganZyme safe for children? Should I take VeganZyme with prescription medications? Will VeganZyme impact the body’s ability to produce its own enzymes? What is the Difference between Wobenzyme N and VeganZyme? What is the difference between animal and vegetarian based enzyme supplements? Digestive enzymes, such as amylase, protease and lipase break down foods into smaller components that are more easily absorbed. Enzymes are secreted throughout the digestive tract. Beginning in the mouth, starches and fats break down as they are chewed and mixed with saliva, which contains amylase (ptyalin) and lingual lipase. Once swallowed, it travels to the stomach where protease pepsin begins to break down protein into smaller peptides and amino acids. This mixture is transferred to the first part of the small intestine. A number of proteases (trypsinogen and chymotrypsinogen, for example) are released with pancreatic lipase and amylase from the pancreas in their inactive forms into the small intestine where they are activated. Systemic enzymes help other processes in the body and control swelling, reduce fibrin (a blood-clotting factor) levels, thin mucus, support cardiovascular and joint health, and more. Systemic enzymes have been used in many types of therapy and it has been suggested that enzyme supplementation is probably beneficial for most people. Yes. VeganZyme is appropriate for everyone. FCC stands for Food and Chemical Codex. This codex standardizes the activity units of enzymes for easy comparison. Historically, enzymes have been measured using different units at the discretion of the manufacturer or scientist measuring activity. There is now an attempt within the nutraceutical industry to use standardized measurements so that materials are comparable from product to product and between suppliers. Compounding this problem is the fact that there are often many grades of raw materials available from raw material suppliers, meaning that you must multiply the activity per gram of the particular enzyme by the weight of the amount that is used per serving in order to calculate the activity of the amount that you are ingesting. This can be listed in different ways on supplement labels, so it is important to make sure you understand what you're getting. The VeganZyme label indicates the activity per serving for ease of use. If you are trying to compare a number of different products that use different units of activity, it may not be possible since they may measure completely different actions for which there is no equivalency. Yes, VeganZyme is safe for infants, toddlers, and young children. In most cases, digestive enzymes can safely be taken with medications. However, discuss with your healthcare provider. Prescription blood thinning agents are one item of caution and absolutely require a consultation with your physician before beginning an enzyme regimen. No. Hormones, not enzymes, control the secretion of enzymes. Wobenzyme N is a popular enzyme formula containing 5 essential enzymes: pancreatin, papain, bromelain, trypsin, chymotrypsin. It is a well respected enzyme formula; however,it is made with animal-derived enzymes that have a relatively narrow pH range, meaning that there is less potential for enzyme activity across the spectrum. Additionally, it does not contain the wide range of proteases, cellulases, and other enzymes like glucose oxidase in VeganZyme, so you cannot use it as either as a systemic or digestive enzyme blend. Wobenzyme is not suitable for vegetarians. It also contains toxic compounds such as silica, magnesium stearate, microcrystalline cellulose and possibly the pH resistant enteric coat. VeganZyme contains no harmful by-products. Many digestive and systemic enzyme supplements contain animal sourced enzymes, usually pancreatic tissue from pigs. Many people prefer vegetarian supplements which tend to produce more digestive and systemic activity than animal enzyme supplements. Vegetarian enzyme supplements are active over a broad pH range and start working almost immediately after consumption. They are also produced in a controlled environment without toxic chemicals or ingredients. Animal enzyme supplements are obtained from slaughterhouse pigs, which may have been given vaccinations, hormones, GMO food, steroids, antibiotics and other harmful substances.